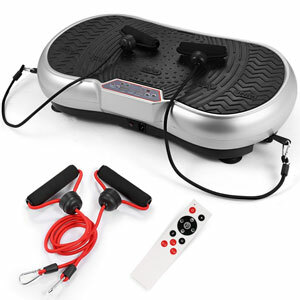 This GENKI Slim 120 Speed Vibration Plate offers enough options and features to motivate new users. Most users talk about the potential for a good daily workout thanks to the vibrations and options. There are 120 different speed levels to suit different needs. This means newcomers can start out slow and more experienced users have something more intense. There are also 8 exercise modes in the programming which include Walking, Jogging, Running and Yoga. The bonus resistance cords help with the latter and increase the impact of the machine across the body. Many also love the user-friendly design. This is a small portable device, with a choice of fun colours and a helpful remote control. The inclusion of the handle and roller is a nice touch to help users move the vibration machine into position. It also comes with an anti-slide mat for the floor and an exercise poster, among other features. Both offer users confidence and security to try out some different poses at home. 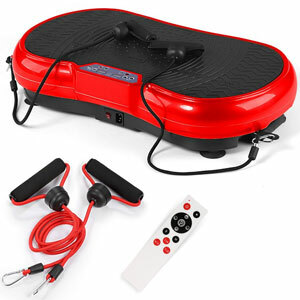 Still, some feel that this GENKI Slim Vibration Power Plate doesn’t have the effect and intensity they were after. There are some people that lower their star rating for this product because of the results seen. This isn’t going to produce drastic results in a short space of time. Some attribute this to the power, which is perhaps not quite as intense as some other models. Then there are those that put too much faith in this vibration machine alone. The stories of efficient weight loss and toning aren’t the result of this machine alone. There has to be a strong diet and exercise plan in place. Others point out that it is a little noisy, but not so much that it becomes annoying. Is this GENKI Portable Power Plate still recommendable with this in mind? This is a weight loss aid, not a weight loss solution. In other words, this can only give users great results if they put in the hard work. Those that use a slow setting a couple of times a week and no other dietary aids will struggle. Those that use the different speeds, resistance band, workout poster and a diet plan can succeed. This portable, slim machine is a great starting point for newcomers looking to test the potential of power plates. Therefore, the GENKI vibration plate is still recommendable. Find more reviews about the GENKI Slim Vibration Power Plate on Amazon here.